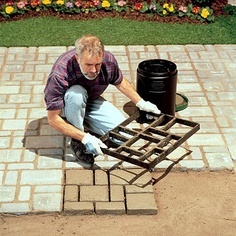 Just 3 simple steps: Pour quick-set concrete into the mold on any flat surface. Smooth with a trowel. Wait one minute, lift mold and move on. This mold measures 20 inches x 24 inches x 2 inches, and holds one 60 pound bag of premix concrete. Makes a straight path or patio.